On March 10, Atty. Mel Sta. 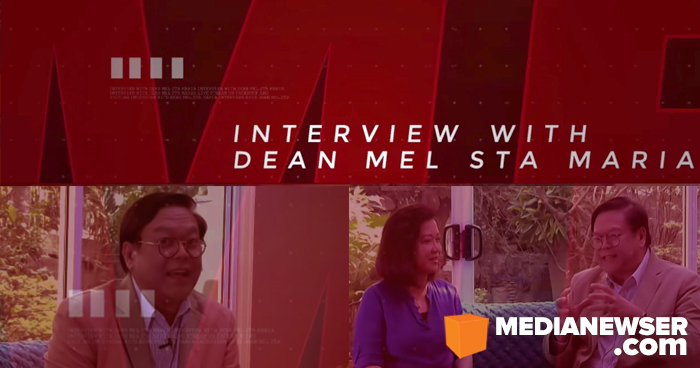 Maria scored a big "get" for his webshow, Diskusyon with Dean Mel, when he sat down with Chief Justice Maria Lourdes Sereno for a wide-ranging interview. To set the mood, Sta. Maria and his team dubbed the interview as an "exclusive," with teasers uploaded on the webshow's Facebook page days prior to the live broadcast. But was it really an exclusive? Hardly, as broadcast networks like GMA News TV and CNN Philippines had the Chief Justice days earlier. A big "get" indeed. But not in any way exclusive. Regardless, the interview was compelling enough and Sta. Maria once again showcased his interviewing skills, first seen during his much-talked about interview with former President Noynoy Aquino almost four years ago. "Kayo po ay nasa gitna ng maituturing hong pambubugbog at nangagaling sa napakadaming dako. Maaring sabihin natin nai-inspire ng ehekutibo at nakita naman po natin doon sa House of Representatives. Papaano niyo po 'yan natatagalan at nasisikmura?" Sta. Maria asked as he began to quiz Sereno. "Malinaw naman kasi ang aking pakay sa buhay. 'Pag binigyan ka ng isang katungkulan, at ang katungkulan na ito ay pagsisilbi, pagtataya ng sarili, naniniwala tayo na walang kabuluhan ang ating buhay hangga't hindi talaga ito buong pusong pagtataya ng sarili. Ngayon, anuman ang sinasabi mong pambubugbog, panlalait, pangungutya, na sinasabi nila ginawa ko raw na karumal-dumal, eh sinasabi ko naman sa kanila hinahamon ko naman kayo, pumunta po tayo sa Senado at patunayan niyo," Sereno said. For the Chief Justice, the Senate, which serves as the impeachment court, is the only proper forum where they can talk about her case. "Let the people decide. It's part of their right to information. It's part of our constitutional process of growing up as a democracy. And people will learn a lot. This is a chance for us to really be able to talk about democracy as a people. And it's going to be quite exciting," she said. As the conversation went on, Sta. Maria also asked Sereno to comment on her colleagues at the Supreme Court, particularly those fellow justices who are calling for her resignation. "Ang kailangan kasi sa puntong ito, Mel, mas matindi ang aking mensahe o panawagan na sinasabi ko sa aking mga kasamahan, matatapos rin naman ito, itong ating pagdadaanan. At 'pag nangyari 'yun, kaya naman nating magbuklod-buklod. Kung may mga masasakit mang salita na narinig, kaya namang isantabi 'yun, alang-ala sa bayan," she said. Later, Sereno, who was in front of millennial law students during the live broadcast, was also asked to speak about the importance of free speech, and how judicial independence is necessary in a democratic society. "Ang foundational truth po ng demokrasya ay lahat ng tao may karapatang mapagkingan — ang mailabas ang kanilang opinion. At sinasabi rin po sa isang democracy kailangan may checks and balances," she said, adding that power concentrated in the hands of few individuals would likely lead to abuse. In a later block, law students invited by Sta. Maria were given a chance to participate in a townhall-like setup. One of them asked the Chief Justice to comment on bullying that is prevalent in this digital age and the growing epidemic of fake news. "Ganito ang unang sabihin niyo, 'Hindi ako magpapabully physically, on a face-to-face confrontation, or even over social media, because I know myself and nothing that they say about me can affect my view of myself.' You must start with that. And then when you are physically confronted, you say, 'No, you don't bully me. You have no right to bully me. You step aside.' In other words, ang stance mo, you move, you give way, because we are the stronger force," Sereno said. "In the same way, you must help your friends. Kapag nagpo-propagate sila ng fake news, ipakita niyo sa kanila ang correct data. Sipagan niyo na lang. At yung mga kaibigan niyo at kamag-anak na minsan nagkakamali, nagpopost ng mga maling sites, sabihin niyo, 'Hindi po ito, ito ang totoo.' Sipagan niyo lang ito kasi this is already a campaign for truth. And with too much untruth babagsak po ang lipunan natin. The future of the Filipino is at stake with the proliferation of fake news," she added. Production value-wise, Diskusyon with Dean Mel, at least during its interview with the Chief Justice, wasn't as polished as expected. In addition to excessive audio dropouts and awkward camera angles — a staff wandered into the frame a number of times — the webshow also suffered from bad lighting. But disregarding all of these fixable issues, DWDM can potentially become a game-changer in the digital arena, where so-called "influencers" — like you know who — use their voice to promote misinformation and divisiveness. As for Sta. Maria, we certainly hope he can commit himself to more interviews as he has proven to be an effective storyteller and interviewer — one who knows what questions to ask and when to ask them. Just imagine him doing a one-on-one with President Rodrigo Duterte. That would be interesting to watch! Follow Diskusyon with Dean Mel on Facebook and YouTube and Atty. Mel Sta. Maria on Twitter @attymeltweet.